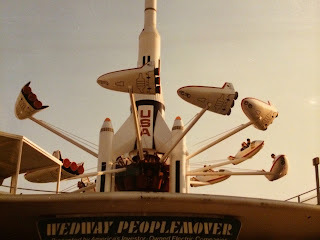 Many years before Astro Orbiter was the "weenie" that drew guests into Tomorrowland, the attraction atop Rocket Tower Plaza was called Star Jets. It was essentially the same ride, but it had an entirely different look, which matched the area's "white" motif of the 70s and 80s. 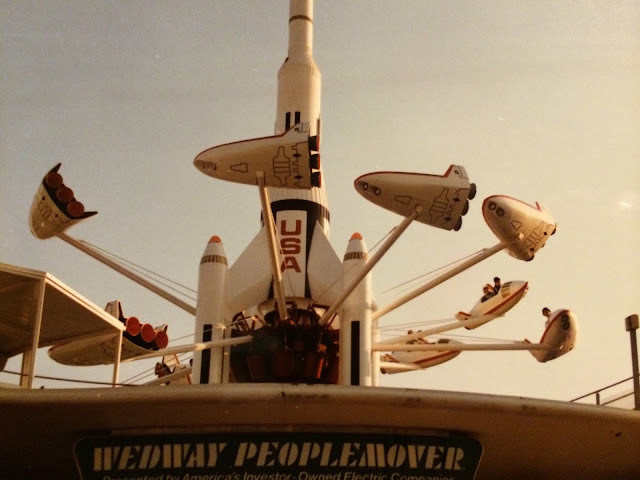 In 1994, Tomorrowland was re-imagined to have a "Buck Rogers" look at the future, and the Star Jets became the much more colorful Astro Orbiter. This shot was from our family vacation in 1984.